Have You Ever Seen Anything like This From A Jockey? In horse racing there has been some very strange moments in which personal errors by mostly jockeys have led to them falling off the horse and being highly embarrassed, but in some cases a jockey can stay on his horse and be just as embarrassing if not more so. This is what has happened here in a jumps race in Ireland where Roger Loughran has came up with one of the most embarrassing moments in jumps racing histor. 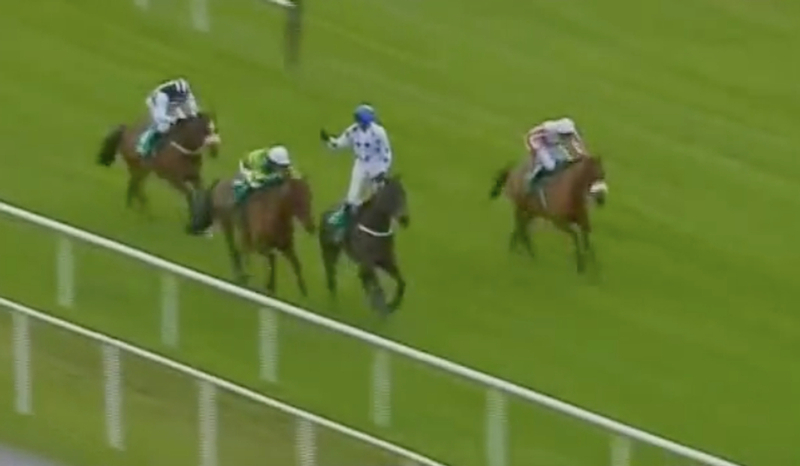 The jockey seems to have somehow mistaken the end of the railing for the finishing line. This then warrants him to stand up on his horse celebrating winning the race whilst the ther horses are still actually running the real race with a furlong left to go. Unfortunately for him this mistake is now forever on the internet for millions to go back and see but we thought we would be nice enough to show it you at the bottoms of the blog. To add fuel to the fire after not having it bad enough of the self pity he was feeling Loughran also picked up a 14 day ban for his actions. This error from the jockey was thought to have cost punters at the racecourse and betting online in the region of more than £1 million which really did make Loughran an unpopular man. We do feel sorry for the jockey but for the sheer comedy value it has to go down as one of the funniest moments in the sport and something that is definitely not seen that often.